Discussion in 'Education & Research' started by Asmodeus, May 14, 2010. Some of the earliest species of bird would probably have been unable to flap their wings because their feathers were too weak, new evidence suggests. Researchers believe species such as Archaeopteryx, which lived 140 million years ago and is considered to be the first true bird, may not have been capable of powered flight. Fossil studies of Archaeopteryx, which experts say looked like a feathery dinosaur with wings, show that the species had thinner shafts on its feathers than those of modern birds. A team led by Robert Nudds, from the University of Manchester, calculated that the feathers would have been too feeble for flapping wings and barely strong enough to support gliding from tree to tree. The same was true of Confuciusornis, a later bird that lived 100 million years ago. The researchers wrote in the journal Science: ''If Archaeopteryx and Confuciusornis were flapping fliers, they must have had a feather structure that was fundamentally different from that of living birds." Mysterious near death experiences may be caused by a surge of electrical activity in the brain moments before it dies, it has been claimed. Doctors believe that a burst of brain activity occurs just before death and this could account for vivid "spiritual" experiences reported by those who come back from the brink. The researchers suggest this surge could be why some patients who have been revived when close to death report sensations such as walking towards a bright light or a feeling that they are floating above their body. “We think the near-death experiences could be caused by a surge of electrical energy released as the brain runs out of oxygen,” said Dr Lakhmir Chawla, an intensive care doctor at George Washington University medical centre in Washington. Many revived patients have reported being bathed in bright light or suffused with a sense of peace as they start to walk into a light-filled tunnel. A few even say they experienced visions of religious figures such as Jesus or Muhammad or Krishna, while others describe floating above their own deathbed, observing the scene. Dr Chawla believes such experiences have a biological explanation rather than a metaphysical one. In the research he used an electroencephalograph (EEG), a device that measures brain activity, to monitor seven terminally ill people. The medical purpose of the devices was to make sure that the patients, suffering from conditions such as cancer and heart failure, were sufficiently sedated to be out of pain. However, Dr Chawla noticed that moments before death the patients experienced a burst in brainwave activity lasting from 30 seconds to three minutes. The activity was similar to that seen in people who are fully conscious, even though the patients appeared asleep and had no blood pressure. Soon after the surge abated, they were pronounced dead. Dr Chawla’s research, published in the Journal of Palliative Medicine, is thought to be the first to suggest that near-death experiences have a particular physiological cause. Although it describes only seven patients, he says he has seen the same things happening “at least 50 times” as people die. Solar physicist Dr David Jess explains why the summer solstice is represents scientists' best opportunity for studying the Sun. Last night marked the summer solstice – the longest day of the year, and the period when the Sun reaches its northernmost latitude and highest point in the sky at noon. For me and my fellow solar physicists, the summer solstice offers an excellent opportunity to study our solar system’s fiery star. Far from being stable, this 4½ billion-year-old star is on its way to “solar maximum”, a stage in its cycle where activity – in the form of flares and eruptions – is most common. This 11-year cycle has been ramping up lately, with flare activity occurring almost daily. While these phenomena can create spectacular sights, their impact is not contained in the realm of the Sun’s atmosphere, but can generate severe space weather that affects us on Earth. During a previous solar maximum, a large solar storm generated such significant flare activity – releasing huge amounts of charged particles in the direction of Earth – that it caused a blackout in Canada. Not only can the Sun short-circuit power grids, but television and mobile-phone satellites positioned in orbit are vulnerable to solar onslaughts, as they are not protected by the Earth’s atmosphere. One severe solar storm could cause catastrophic damage to these systems. So studying the Sun and trying to determine how its heating, flaring and energy transport mechanisms work will provide us with a key insight into how we can protect ourselves from solar-influenced “weather”. Furthermore, the fact that we understand so little about the Sun suggests that there are plenty of new theories and pieces of evidence to uncover. British researchers are involved in some of the most advanced solar studies, and as many of the best facilities are in the Northern Hemisphere – such as the six-camera Rosa system in New Mexico, which was developed at Queen’s University Belfast – the height of summer provides the best time to study our Sun. There are many questions that need answering. For example, the Sun’s heat energy does not act in the manner that many would expect. Typically, if you move away from a heat source, the temperature declines. The surface of the Sun has a temperature of about 6,000 degrees, yet a few thousand miles above its surface, that rises to well over one million degrees. This heat ring around the Sun, the solar corona, is what we see during a solar eclipse. But how can this phenomenon be explained? In the absence of traditional heat flow, other theories have been explored. Studies of these solar atmospheric layers have shown that they can reach in excess of 10 million degrees in the presence of solar flares, as a result of built-up energy being released. Researchers have suggested that many small-scale flares are occurring all over the Sun’s surface, converting its magnetic fields into heat energy. An alternative theory suggests that waves, similar to the ocean’s, cause this rapid temperature rise. Our instruments have shown that the Sun’s surface resembles a bubbling cauldron, and as these waves travel outwards along the lines of the magnetic fields, they may convert their energy into heat. The only way to resolve this debate is to improve our instruments and facilities. As our energy supplies diminish, the Sun is a resource that must be explored – indeed, as a nuclear fusion reactor that is continually active, it has the potential to become the Earth’s key source of nuclear energy. With the involvement of British researchers, we can get a step closer to exploiting this limitless resource. Dr David Jess is a solar physicist at Queen’s University Belfast. He is supporting the “What’s The Big Idea?” campaign, which underlines the role academics play in the UK’s economic and social development. The whole of Mars' surface was shaped by liquid water around four billion years ago, say scientists. Signs of liquid water had been seen on southern Mars, but the latest findings reveal similar signals in craters in the north of the Red Planet. The team made their discovery by examining data from instruments on board Europe's Mars Express and Nasa's Mars Reconnaissance Orbiter. They report the findings in the latest issue of the journal Science. John Carter, of the University of Paris, led the team of France- and US-based scientists. 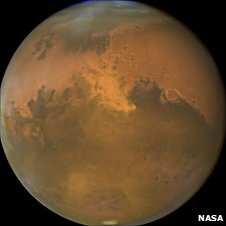 "Until now, we had no idea what half Mars was made of in terms of mineral composition," he told BBC News. "Now, with the Esa and Nasa probes, we have been able to get a mixture of images and spectral information about the composition of the rock." He explained that these instruments had revealed clay-type minerals called phyllosilicates - "the stuff you would find in mud and in river beds." "It's not the species of mineral itself that's important," said Dr Carter, "it's more the fact that the minerals contain water. "This enhances the picture of liquid water on Mars." Previously, researchers have seen similar signs of water in the highlands of southern Mars in rocks that are up to four billion years old. But in the northern part of the planet, more recently formed rocks have buried the older geology. The prevailing theory for why this is, is that a giant object slammed into northern Mars, turning nearly half of the planet's surface into the Solar System's largest impact crater. Dr Carter explained that this meant a thick veneer of younger rock covered the older geology, "so the craters are the only way of accessing the older stuff". But the craters are relatively small and more difficult for the orbiting probes to take measurements from. "There's also ice and dust coverage in the north of the planet, making it harder to get signals from these craters," said Dr Carter. The new findings suggest that at least part of the wet period on Mars, that could have been favourable to life, extended into the time between that giant impact and when volcanic and other rocks formed an overlying mantle. This indicates that, 4.2 billion years ago, the planet was probably altered by liquid water on a global scale. But Dr Carter said that the findings did not paint a picture of huge Martian oceans. "It was probably a very dry place," he said. "But we're seeing signals of what were once river beds, small seas and lakes." Scientists have come up with a new technique that will turn pulsars - natural cosmic clocks - into accurate time-keepers. The work will improve studies of the origins of the Universe, including the search for gravitational waves. Researchers, led by a team from the University of Manchester, used Britain's world famous Lovell Telescope at Jodrell Bank Observatory for the project. Gravitational waves are mysterious, powerful ripples which have not yet been directly observed, although are known to exist and were predicted by Einstein. The direct discovery of gravitational waves, which pass over cosmic clocks and cause them to change, could allow scientists to study violent events such as the merging of supermassive black holes and help understand the Universe shortly after its formation in the Big Bang. The scientists made their breakthrough using decades-long observations from the 76-m Lovell radio telescope at The University of Manchester's Jodrell Bank Observatory to track the radio signals of extreme stars known as pulsars. Pulsars are spinning collapsed stars which have been studied in great detail since their discovery in 1967. The extremely stable rotation of these cosmic fly-wheels has previously led to the discovery of the first planets orbiting other stars and provided stringent tests for theories of gravity that shape the Universe. However, this rotational stability is not perfect and, until now, slight irregularities in their spin have significantly reduced their usefulness as precision tools. The team, led by the University of Manchester's Professor Andrew Lyne, has used observations from the Lovell telescope to explain these variations and to demonstrate a method by which they may be corrected. Professor Lyne explains: "Mankind's best clocks all need corrections, perhaps for the effects of changing temperature, atmospheric pressure, humidity or local magnetic field. Here, we have found a potential means of correcting an astrophysical clock". The rate at which all pulsars spin is known to be decreasing very slowly. What the team has found is that the deviations arise because there are actually two spin-down rates and not one, and that the pulsar switches between them, abruptly and rather unpredictably. These changes are associated with a change in the shape of the pulse, or tick, emitted by the pulsar. Because of this, precision measurements of the pulse shape at any particular time indicate exactly what the slowdown rate is and allow the calculation of a "correction". This significantly improves their properties as clocks. The results give a completely new insight into the extreme conditions near neutron stars and also offer the potential for improving already very precise experiments in gravitation. It is hoped that this new understanding of pulsar spin-down will improve the chances that the fastest spinning pulsars will be used to make the first direct detection of ripples, known as gravitational waves, in the fabric of space-time. The University of Manchester team worked closely on the project with Dr. George Hobbs of the Australia Telescope National Facility, Professor Michael Kramer of the Max Planck Institute for Radio Astronomy and Professor Ingrid Stairs of the University of British Columbia. "Astronomy is unlike most other sciences, as we cannot go out and measure directly the properties of stars and galaxies. Universe works-which means that something as significant as being able to use pulsars as cosmic clocks, a new standard for time measurement, will have far-reaching consequences for advancing science and our understanding of the Universe." Many observatories around the world are attempting to use pulsars in order to detect the gravitational waves that are expected to be created by supermassive binary black holes in the Universe. With the new technique, the scientists may be able to reveal the gravitational wave signals that are currently hidden because of the irregularities in the pulsar rotation. Stappers said: "These exciting results were only possible because of the quality and duration of the unique Lovell Telescope pulsar timing database". BTW, instead of a pulsar, a black hole would be a better place to experience gravitational waves. The waves can not be detected as of yet. Pulsars can't affect the waves enough so as to make it detectable. A flying star around a black hole would give some nice readings to study. Better yet a pulsar around a back hole but they are too too rare. I am not aware of any existing. there are different types of pulsars. Some are very accurate. They might not be accurate as per astrophysics (which takes into account millions or billions of years), but for humans, with a life span of 60-70 years and a history of just 10,000 years, the pulsars can be way way more accurate than atomic clocks. They are very consistent for a few million years. Newly discovered pulsars have pulse time of over 1-1.5 milli seconds, which make them excellent time keepers. 10,000 years are like nano seconds in the life time of a neutron star. Indian astronomers will join a project to build the Thirty Meter Telescope Project (TMT) on Mauna Kea in Hawaii. TMT is the next-generation astronomical observatory that is scheduled to begin scientific operations in 2018 on Mauna Kea. It has completed its 77 million dollar design-development phase and has entered the early construction phase after an additional 200 million dollar pledge. Minister of science and technology, Prithviraj Chavan, announced Friday that the nation will join TMT as an observer, the first step toward becoming a full partner. â€œIndia is well recognized and respected as one of the top-ranking countries in the field of basic research and India will be an integral part of the next generation of astronomical research as a part of TMT,â€￾ said Henry Yang, chairman of the TMT board and Chancellor of the University of California, Santa Barbara. The Thirty Meter Telescope Project team praised India for its participation in the project. â€œThe TMT and its partners are extremely pleased that India has selected TMT as their next-generation astronomical research project,â€￾ said Edward Stone vice chair of the TMT board and Caltechâ€™s Morrisroe Professor of Physics. The University of California, the California Institute of Technology and the Association of Canadian Universities are building the telescope for research in astronomy. The core technology of TMT will be a 30-meter segmented primary mirror which, will give TMT nine times the collecting area of today's largest optical telescopes and three times sharper images. The National Astronomical Observatory of Japan (NAOJ) joined TMT as a Collaborating Institution in 2008 while its Chinese counterpart joined TMT as an Observer in 2009. The University of Hawaii's Board of Regents is due to vote on the project on Monday. It must give its approval because it owns the lease on the land where the telescope is to be built. This was announced by Minister of State for Science and Technology Prithviraj Chauhan in California on Friday. The observatory is scheduled to begin operations in 2018. India has been granted observer status on the TMT Board. This is the first step to becoming a full partner in TMT, which will mean participating in the development and scientific use of what will be the world's most advanced and capable astronomical observatory, according to the press release by the TMT project team. The proposal to join the TMT project was initiated by three Indian institutes engaged in astronomy: the IUCAA, the Indian Institute of Astrophysics (IIA), Bangalore, and the Aryabhata Research Institute of Observational Sciences (ARIES), Nainital. â€œThe government had regarded our proposal as a reasonable one and hence the decision,â€￾ Professor Kembhavi added. â€œThe government and people of India recognise the importance of embarking on world class, international science collaboration,â€￾ said Science and Technology Secretary T. Ramasami, who had accompanied the Minister to sign the agreement. Originally, there were three international telescope projects to choose from for Indian participation: the 42-m European Extremely Large Telescope (E-ELT) of the European Southern Observatory (ESO), the 24.5 m Grand Magellan Telescope (GMT) and the TMT of the United States. The E-ELT, in fact, has offered observation time on the existing ESO telescopes before it comes into operation. Indian scientists will have access to the existing telescopes operated by Caltech, the nodal institution for TMT. The TMT project is an international partnership among Caltech, the University of California and the Association of Canadian Universities for Research in Astronomy. The National Astronomical Observatory (NAO) of Japan joined TMT as a collaborating institution in 2008. The National Astronomical Observatories of the Chinese Academy of Sciences joined TMT with the observer status in November 2009. The TMT was proposed by American scientists after the enormous success of the first new technology telescope, the twin 10 m Keck Telescope, on Mauna Kea. The TMT's primary mirror builds on the technological and operational heritage of Keck. Like existing ground-based observatories, TMT will be capable of observations with a spatial resolution limited by the natural turbulence of the earth's atmosphere. The TMT will be able to observe objects nine times fainter than Keck in an equal amount of time. However, it will be the first ground-based telescope with Adaptive Optics (AO) as an integral system element. AO denotes systems designed to sense atmosphere turbulence in real time, correct the optical beam of the telescope to remove its effect and enable true diffraction-limiting image on the ground. For any astronomical observations, this is equivalent to observing at a fraction of the cost of a space-based observatory like the Hubble Space Telescope (HST). According to the arrangement, Indian scientists will get a percentage of the observational time proportional to the percentage of the total project cost that the Indian government would be willing to bear. The next steps in the Indian decision-making process would involve an in-principle decision of the Union Cabinet on the extent of contribution and a decision on the mode of financing the pledged amount. Though the final project cost is not yet clear, it is likely to be in the region of $1 billion. The project has, as of now, completed its $77 m design development phase with$50 m from the Gordon and Betty Moore Foundation and $22 m from Canada. The project has now entered its early construction phase, thanks to an additional $200 m pledge from the Foundation. Caltech and University of California have agreed to raise matching funds of $50 m bringing the current construction investment to $300 m. Canadian partners propose to supply the enclosure, the telescope structure and the first light adaptive optics. good news...Indian scientists will benefit a lot by this project.